Most people feel better – emotionally and physically – when the sun is shining and the birds are singing, and with so much time spent indoors and in front of computer screens, it’s easy to want to get out and about whilst the weather is fine! As a medical professional, I know that time outdoors is more likely to result in increased physical activity (another factor that can have a positive influence on our physical and mental wellbeing) and as long as people take adequate sun safety precautions when they are outdoors, I’m all for it! We all need to make the very most of the 5.3 days of Summer we actually get in the UK…! It’s easy to forget to apply the SPF when the weather is cloudy or overcast (though it is important to build this into your skincare regime all year round! ), but I’ve heard some people hold off on the SPF application on a hot, sunny day ‘to help top up their Vitamin D levels’. But does this really work? Do we need to risk skin damage to take on sufficient Vitamin D? Seeking out a shady spot when the sun is strongest between 11am and 3pm. So what do I say to those people who strongly believe that a tan makes them look good and healthy? My response is always to ‘fake it’! Long-term UV exposure can lead to reduced skin elasticity (contributing to the appearance of lines and wrinkles), and can also cause pigmentation and an overall degradation of skin texture, as well as increasing your risk of suffering from Skin Cancer. 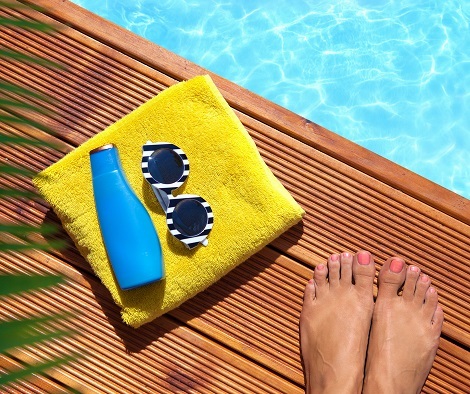 If you want to delay some of the physical symptoms of skin ageing, it’s definitely worth reaching for the fake tan rather than jumping into the sun bed – your skin will thank you for it!